PGT EnergyVue Windows in Tampa Bay and Sarasota, FL: Start Cutting Your Energy Costs Today! PGT EnergyVue windows and doors are the new standard for Non-Impact windows and doors available for homeowners in Florida. Made in Florida, PGT EnergyVue Windows exceed all Energy Star standards with their EnergyShield Max Low-e glass combined with argon gas which insulates the double pane glass. PGT EnergyVue windows also meet the stringent demands that are still necessary for non-impact windows installed in Florida, including design pressures greater than +/-50, which means the EnergyVue window can withstand winds upwards of 140 mph. Using quality materials such as 100% virgin vinyl, patented warm edge spacing system, 3-point locking mechanisms, stainless steel hardware, and more, PGT windows and doors are guaranteed to withstand the severe weather we face year round. Hurricane Windows & Doors has become one of Florida’s largest PGT installation companies, installing PGT windows in single-family homes, condominiums, mobile and manufactured homes, and high-rise buildings throughout the Gulf Coast. With unbeatable prices, an unparalleled level of customer service, and Lifetime Warranties on all PGT products we install, Hurricane Windows & Doors is the #1 Source for PGT EnergyVue windows, doors, and sliding glass doors. Check out all of the offerings from PGT below and call us 24/7 at 727-789-2900 for a Free Estimate and discover the Difference! Click here for the EnergyVue Product Brochure PDF. 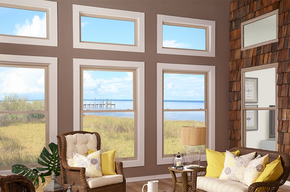 *ALL-NEW* PGT 4500 Series Vinyl EnergyVue Windows meet all of the standards for Florida’s building codes. This also means they will be up to building code anywhere in the United States. As the creators of the original residential impact rated window, PGT’s new EnergyVue Window is essentially a Hurricane Impact-Rated frame without the impact rated laminated glass. The new EnergyVue Series has improved PGT’s non-impact line of windows even more, featuring PGT’s exclusive new “Snap-Lock” automatic locks, Tilt-Latch Secure Connect Technology, Aluminum Interlock built-in to the sashes, PGT Comfort Lift Handles, wood grain color options as well as new interior and exterior colors, and more! Call us for more information about the options available for the NEW EnergyVue, including the Energy Performance Package, Coastal Package, and the Safe & Secure Package which provides additional safety mechanisms. The PGT EnergyVue is the most popular energy efficient residential replacement window in the Tampa, Sarasota, Manatee, and Pinellas County market. PGT 470 Series Sliding Glass Doors: The PGT EnergyVue 470 Series features energy efficient insulated glass. The insulated double pane glass features low-e and argon gas for maximum energy efficiency that meets the most stringent Energy Star demands. 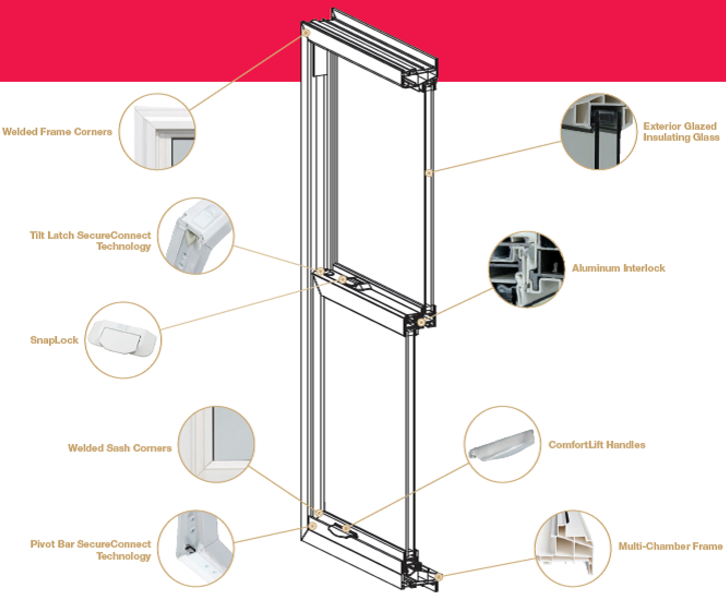 EnergyVue sliding glass doors are available in almost any size and configuration, including panels as large as 5′ x 8′ or 4′ x 10′, By-Pass and Pocket door configurations, Tandem stainless steel rollers, and more. A glass makeup that features two panels of glass which are separated by either air or argon gas to reduce heat transfer. Our double pane glass is manufactured on-site in our facility in Nokomis, FL.